Adapted from an article published in the December 2015 issue of the ASBMB magazine, the “Australian Biochemist”, by Gonzalo Estavillo and Janet Macaulay. 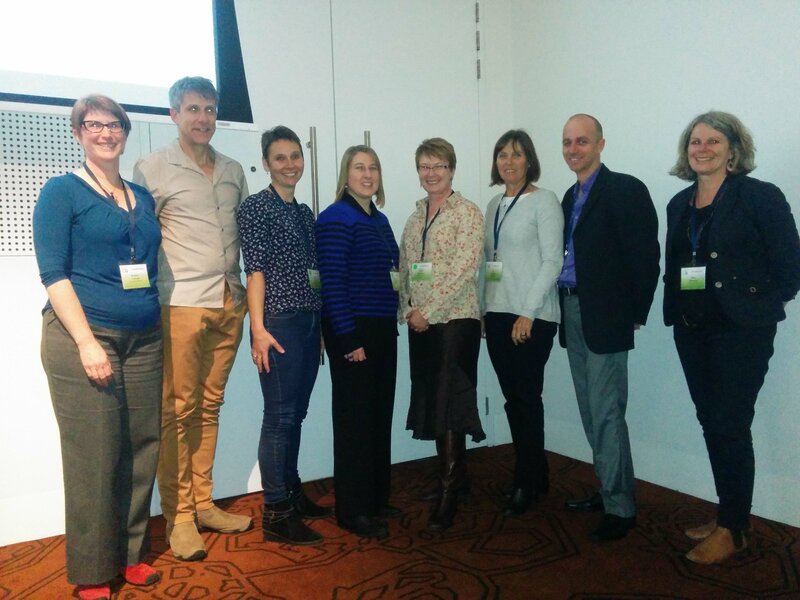 High profile educators, science communicators and academics passionate about teaching participated in the two education focused sessions held at ComBio2015, organized by ASPS and ASBMB. The main themes were ‘Challenges in Research Training’ for the lunch workshop and ‘Innovations in Undergraduate Education’ for the concurrent symposia, both on Tuesday 29 September. Both sessions were well attended by more than 50 people in each providing a good opportunity for both audience and speakers to exchange their thoughts and practices about university science education. 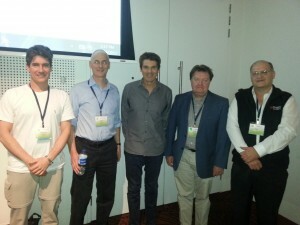 The sessions were coordinated by the Education Representatives from the ASBMB and ASPS, Associate Professor Janet Macaulay (Monash University) and Dr Gonzalo Estavillo (CSIRO Agriculture), respectively. 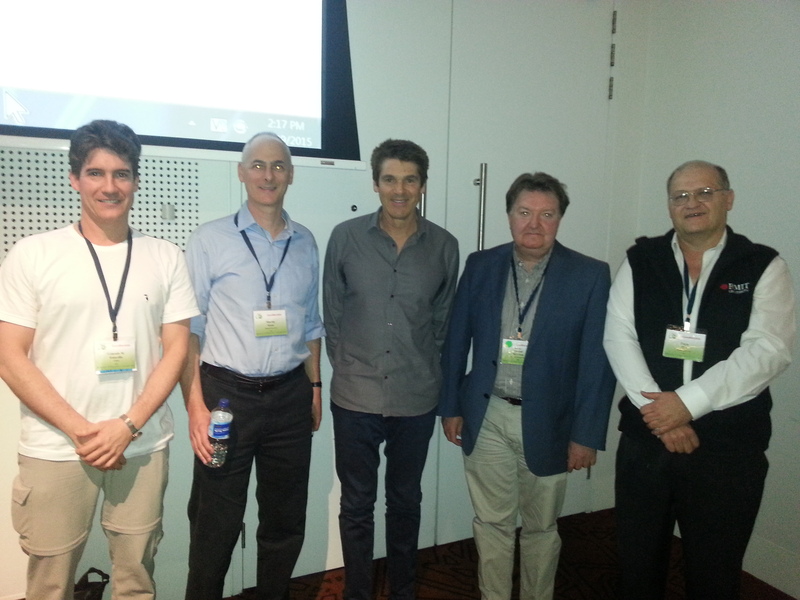 Education Session I, from left: Gonzalo M Estavillo (co-Chair), Martin Stone, Graham Phillips, Alastair McEwan and Terrence Piva (co-Chair). Associate Professor Martin Stone (Director of the MBio Graduate School, Monash University) kick-started Education I: ‘Challenges in Research Training’ session discussing efforts on how to map skills training onto target competencies for graduate students. Five main core competencies for PhD students were identified, including subject area knowledge, technical expertise, critical thinking, communication skills and professionalism. This program has implemented a ‘competencies assessment rubric’ to help students and supervisors assess their progress. Martin highlighted the need for developing a sense of professionalism, defined as self-respect, organisation skills, and ability to prioritise work, as well as being a team player. Finally, Martin identified time, resources and reaching a consensus on what and how to teach as still being the main challenges in graduate education. The second talk of the session was presented by the Dean of the UQ Graduate School, Professor Alastair McEwan. Alastair described a framework identifying transferable skills for employability of PhD graduates. Alastair highlighted that undertaking a PhD “is not a waste of time and that the skills that can be gained” can be used in other profession employment positions. Interestingly, Alastair discussed that the most successful economies of Scandinavia have three to five times more researchers in business enterprise compared to Australia, which is remarkable given that both countries have about the same number of researchers. The challenge learnt is to insure that the skills learnt can be transferred during the PhD directly into the job market. Although the professional skills are relatively easy to acquire and measure during the PhD, transferable skills, that is, skills applicable to other jobs, are not so easy to track. Although transferable skills could be taught during boutique workshops and professional development courses (such as VITAE) and industry placements, they are much harder to assess. Placement or short stays in other organisations could be a good way to assess transferable skills. Finally, Dr Graham Phillips gave an informative talk about his experiences as a science communicator and why he chose science communication as a career path. Graham is a well-known science communicator from the ABC’s Catalyst with a PhD in astrophysics. He also teaches an introductory science communication course co-convened with Associate Professor Ros Gleadow at Monash University. Graham argued that people in most jobs, including scientists, “need good communication skills… and need to have proof of it”. Moreover, he pointed out that “we want to hear more scientific points of view in the media”, highlighting climate change as an example where the participation of more scientists would greatly benefit the debate. “Know your audience and present the big picture story” was his advice to people keen on science communication to a non-specialised audience. Extra time in the Education I session allowed for a very interesting Q&A session between panellists and the audience, which completed this highly educational symposium. Education II: ‘Innovations in Undergraduate Education’ started with a presentation by Dr Peter Arthur, winner of the 2015 ASBMB Beckman Coulter Education Award. Peter discussed a process which had been introduced at UWA to measure the effectiveness of achievement of teaching goals within lab classes. This system allows review of assessments to ensure alignment of assessment and instruction. Peter was followed by Associate Professor Ros Gleadow who spoke about harnessing digital tools to improve undergraduate teaching. Ros has redesigned the landing screen and general format of the Moodle site to a more student friendly and engaging format which is more interactive, enabling greater student collaboration. She uses social media tools such as Twitter and Facebook to closely engage with the students. The next presentation was a team presentation by Dr Beth Loveys and Dr Karina Riggs who discussed flipping laboratory classes. Their model of a flipped class enables the incorporation of learning activities covering the range of Blooms taxonomy – pre-class: remember and understand; during class: apply and analyse; and post-class: evaluate and create. They use online pre-practical activities to ‘flip the laboratory’ with agriculture and viticulture science students. They also argued that students gained broader knowledge, better understanding and gained greater confidence after those pre-practical activities. Importantly, students’ marks significantly increased after their new approach. Dr Patrick Schaeffer then discussed a successful approach taken in a biotechnology course to prepare students for real world challenges. The molecular biology course integrates experimental design, critical and analytical thinking and laboratory work in real-world situations. Associate Professor Susan Rowland discussed the struggles and issues associated with undergraduate research. This presentation discussed the scale of student experiences from standard practical classes to ALURE (Authentic Large-scale Undergraduate Research Experience) to URE (Undergraduate research experience). Susan talked about the ALURE project and the issue of what is authentic research. Collectively all these speakers delivered highly insightful presentations which opened up deeper thought on how we can all be more effective in our communication delivery and better approach the road to educational discovery.